→94MY – replacement every 36,000 miles or 4 years, whichever occurs first. 95-96MY – replacement every 40,000 miles or 4 years, whichever occurs first. 97MY→ – replacement every 40,000 miles or 4 years, whichever occurs first (tensioner pulley must also be replaced). RH engine mounting (PAS and AC)  . C18XE/XEL: Mass air flow (MAF) sensor. Mark direction of rotation on auxiliary drive belt with chalk. Turn auxiliary drive belt tensioner clockwise to release tension on belt  . Use suitable spanner. Turn crankshaft clockwise until crankshaft pulley timing mark aligned  . Ensure ‘INTAKE’ timing marks aligned  . Ensure ‘EXHAUST’ timing marks aligned  . If timing marks on camshafts not aligned: Turn crankshaft one turn clockwise. Turn tensioner clockwise until pointer on LH stop  . Use Allen key  . Lightly tighten tensioner bolt  . Ensure lug on water pump aligned with corresponding lug on cylinder block  . Ensure timing marks aligned  ,  &  . NOTE: If camshaft sprockets have been removed: Ensure correct dowel location of sprockets. Fit timing belt.NOTE: Belt adjustment must be carried out when engine is cold. Turn tensioner anti-clockwise until pointer on RH stop  . Use Allen key. Fit crankshaft pulley. Tighten crankshaft pulley bolts to 20 Nm  . Turn crankshaft two turns in direction of rotation until timing marks aligned  . ‘V’ notch in bracket (new belt)  . LH edge of ‘V’ notch (used belt)  . Tighten tensioner bolt to 20 Nm  . 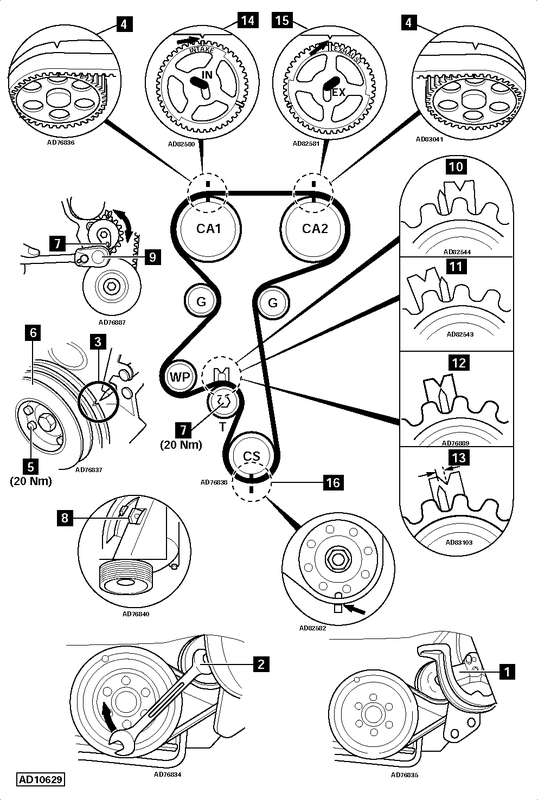 Install components in reverse order of removal.NOTE: Observe direction of rotation marks on auxiliary drive belt.